2014 has been a banner year so far for the WD9BSA station. The month of February, in particular. We’ve had some great participation in spite of record cold and snowfall. The month of January kicked off with the monthly open hours and a presentation at the University of Scouting leader training event. Hopefully this will bring more awareness to our station in the coming months. Our VE team had a full house at Golden-Burke for our quarterly license test session. After the end of the weekend we’d tested eleven individuals for various licenses and upgrades. In attendance were Scouting youth, adult leaders, and Purdue students. 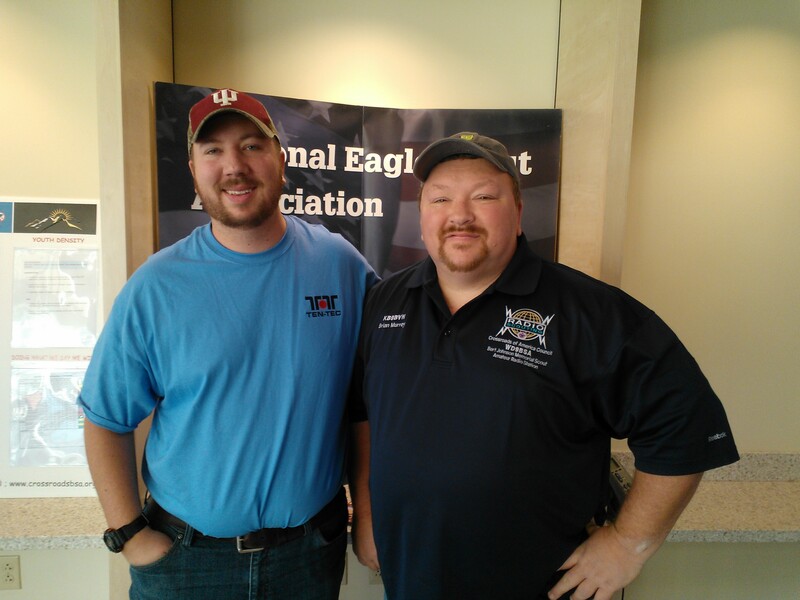 We were pleased to have one of the Purdue students from the W9YB Purdue Amateur Radio Club who is an Eagle Scout. The crew made a long trek down from W. Lafayette! Our Sunday open hours was awesome! We had two dens of Tiger Cubs visit to earn their Achievement 4G: Go See It! This activity is all about communications and requires the boys to visit a newspaper, TV, or radio station. What better place than the Council amateur radio station. The young Scouts have so much energy and enthusiasm. I hope this little bit of exposure to radio and technology will pique their interest in the future. These young boys might be the future of our station just a few years down the road. I think we really made a positive impression on them. They sure enjoyed taking on the radios to each other. A new activity for us was operating D-Star. We were able to link up with a distant reflector and let the boys talk to a ham in another state. And, as usual, we had a lot of visual aids for all to look at. Finally, we look to the future. It’s still cold outside, but we really have some antenna maintenance in store for the spring. The old gremlin of setting off the fire alarm has re-surfaced. This may be contained to the 40m band, but it’s still an issue we need to resolve. I think it’s been over a year since we’ve had this problem. Future plans include new outside antennas up on the hill and away from the building. We also suspect that some moisture has gotten into our feedline in some of the various connections. This is likely the culprit, however, the alarm company hasn’t really done anything to better protect their system from stray RF. We’re in the process right now of securing 500 ft. of new LMR-400 type coax so we can make new, continuous runs out to the antennas. These two items should make a great improvement. Let’s all think warm thought for March. If anyone has blog ideas or wishes to be a blog contributor let me know and I’ll setup credentials for this site. Let’s all stay radioactive! With the exception of the recent Jamboree On The Air operating event held just last month, this past weekend may be our second biggest weekend for the station. 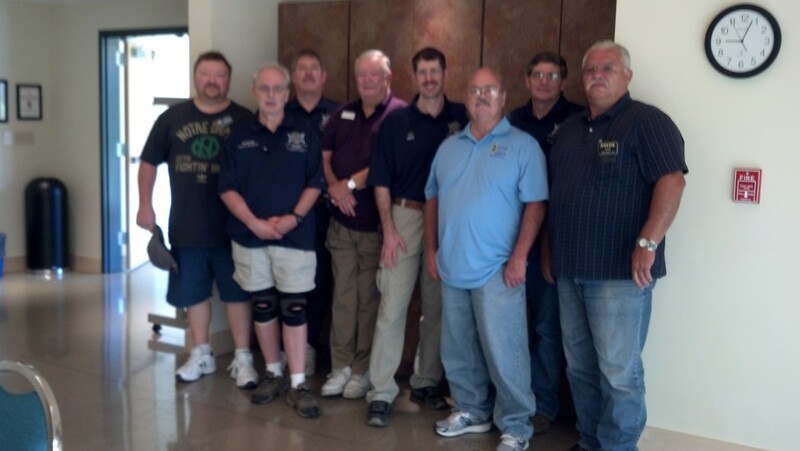 The WD9BSA VE team hosted our second amateur radio licensing session Saturday morning at the Golden-Burke Scout Center. It was well attended and we were able to upgrade a General class to Extra, and two Techs to General class. A hearty congratulations to these hams for their hard work and eager attitude. Our primary team leader, Brian, stepped back this time as his son Andrew had come to upgrade to Extra. That made for a nice family activity. Sunday was our normal monthly station operating hours. We hold this event the second Sunday of every month from 2:00-7:30 PM in the basement of the Camp Belzer Activity Center. This is a non-regimented activity for individual Scouts, Packs, Dens, and even whole Troops to visit the station and get on the air. We had a family of Scouts visit who included parents, a Webelos, and Boy Scout, and their daughter who is a Venturing Crew member. We made contact with a couple hams who were nice enough to take the time to speak with each of them. The second ham we spoke with was even operating bicycle mobile down in Huntsville! Later in the afternoon we hosted a Den of Tiger Cubs. Did they ever have some enthusiasm! They were there to earn their Achievement 4G: Go See It! We discussed all manner of communications from commercial broadcast to FRS walkie talkies like you pick up at the department store. We put them on the air with real amateur radio 2m HT’s and were later able to put some of the boys on the main HF station to speak with a ham in Alberta, Canada. We looked up the station’s callsign on QRZ.com and also used maps to point out geographical locations. Of course all manner of props for the boys to handle made for a lot of fun. Near the conclusion we were able to perform another licensing session for a Scout who wasn’t able to attend on Saturday. We’re pleased to announce that Jacob F. is now our VE team’s first licensed Scout. 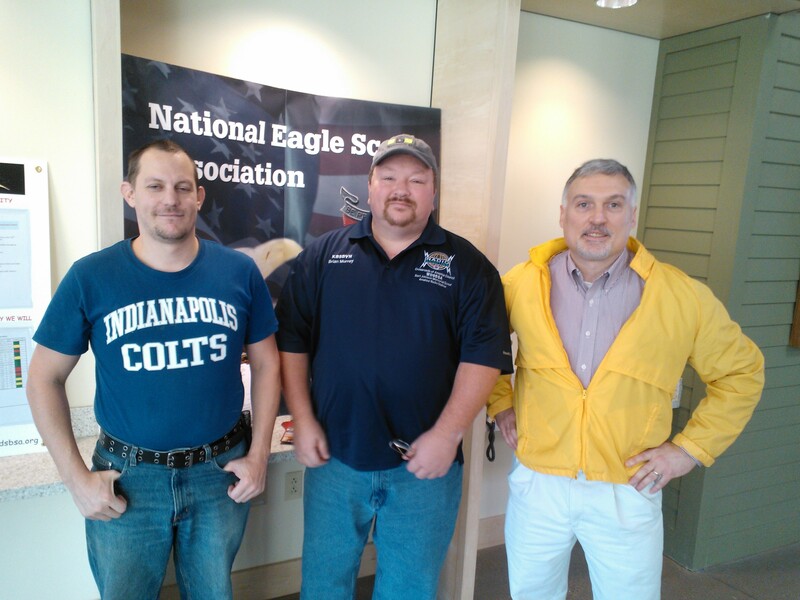 He’s a Senior Patrol Leader of Troop 753 in the Sugar Creek District. 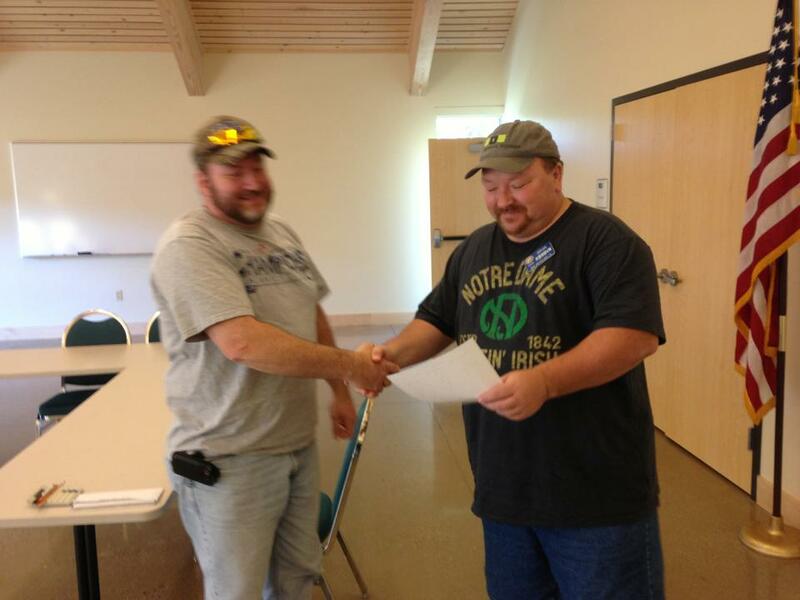 Congratulations to Jacob on earning the Tech class license. As time goes on we hope to license more Scouts and charter an amateur radio Venturing Crew at the station. Amateur radio and Scouting really compliment each other perfectly. The mission of both activities promote the STEM activities, preparedness, volunteering, social and geographical awareness on a local and international scale, and participation in new activities. WD9BSA is happy to provide these opportunities to the Crossroads of America Council. The VE team bright and shiny. I’ve condensed the follow up briefing from our VE team leader Brian Murrey (KB9BVN). Last Saturday morning we officially completed our first FCC amateur license exam session. Our success rate is 100%! We were pleased to take part in the upgrade of a Technician class ham to General class. Of the three scheduled to attend we had one show up. The testing took place in Wilmeth Hall at the Golden-Burke Scout Center. We have this same room reserved for future tests and it should accommodate around 10 exam applicants. Our VE team is up to ten now, but we’re always looking to recruit more…especially Extra class. 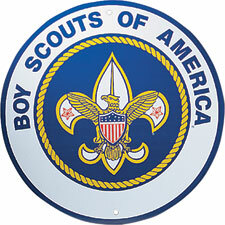 Our main priority will be to serve Scouts as that is the mission of the WD9BSA group. Brian has assembled a VE box with all the necessary paperwork and supplies. Soon we’ll also have badges to wear identifying us as VE team members of the LARC-VEC. I think that’ll add a nice professional look when applicants arrive.